Sponsored by Wildlife Warriors Initiative and Lindsay Cibos (creator of The Last of the Polar Bears) on behalf of Polar Bears International and the Arctic Documentary Project. 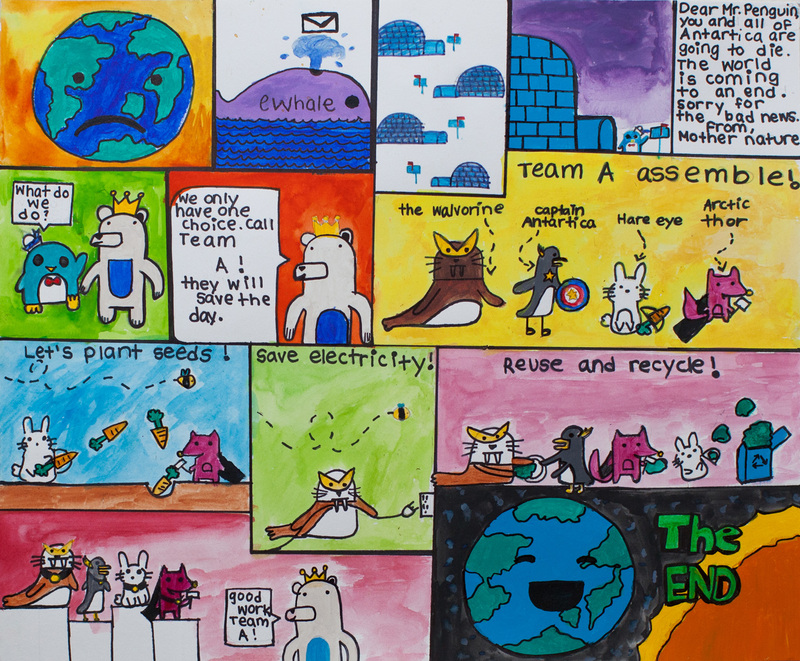 I’m pleased to announce the winners for the 2012 ‘My Arctic Animal’ comic competition! I’m amazed and moved by the creativity, passion and variety of the entries I received. They were incredibly varied, from dramatic, to funny, to heart-wrenching, utilizing every art medium from crayons to digital paint. In fact, there were so many fun and creative entries to choose from, it was difficult to narrow it down to just one for each age group (8 and under, 9 to 13, 14 to 18) plus one overall winner! Everyone who participated should be proud of themselves and their work. What I love about Zefanya’s entry is her clever use of layout to take us on a guided tour of the Arctic through the eyes of the collared lemming, Zaenok. From sword-fighting narwhals to leopard seals used as platforms, the sequence of events packed into this single page makes it a joy to read. Congratulations Zefanya! As the overall winner, Zefanya will receive a Feature profile in Bare Essentials magazine, a $100 PBI polar bear adoption kit, an original illustration by Lindsay Cibos, and a signed copy of the limited edition The Last of the Polar Bears “Pre-Dawn” book. In addition, her lemming character Zaenok will make a cameo appearance in a future The Last of the Polar Bears Side-Story. 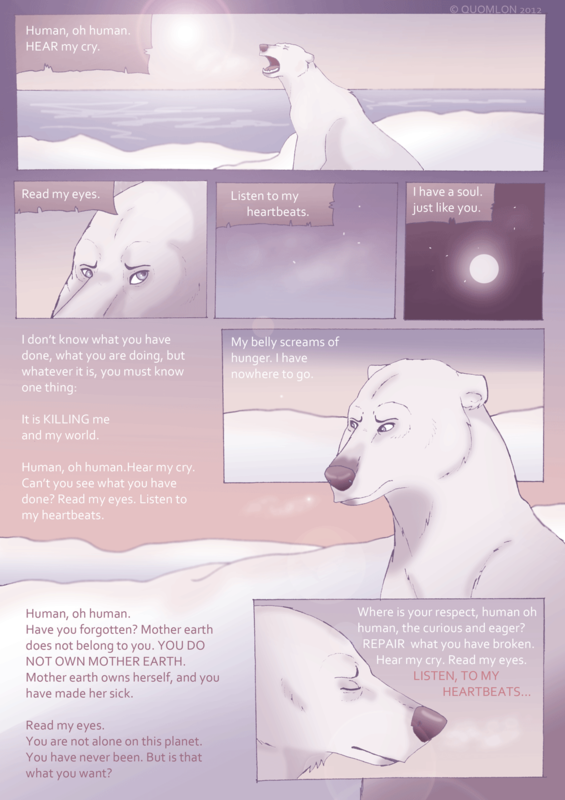 With its bright, vivid colors, Aisyah’s comic manages to feel both uplifting and serious, while using minimal text to convey the message of the polar bears plight. 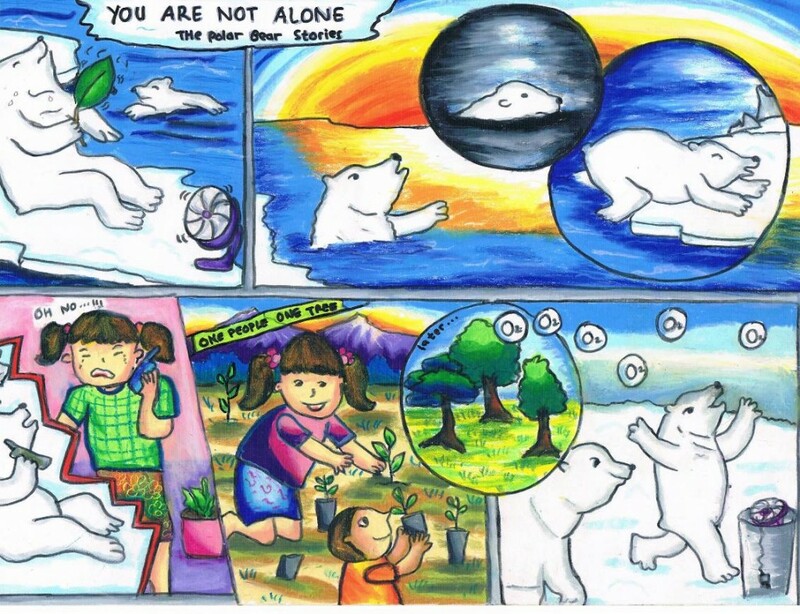 The concept of a polar bear using a cell phone to call for help is adorable, but I especially love how she shows that kids have the power to make a difference in the Arctic from anywhere in the world through the simple act of planting a tree. Bravo! For her winning entry, Aisyah will receive a $30 PBI polar bear adoption kit and a signed copy of The Last of the Polar Bears “Pre-Dawn” book. The whimsical and cartoony visuals of Valerie’s humorous entry won me over immediately. There’s so many things to love: the “Ewhale” spouting a letter, the colorful cast of animal superheroes, the frowning Earth. I particularly enjoyed the panel in which Hare Eye shoots carrot arrows that Arctic Thor helps hammer into the ground. For her winning entry, Valerie will receive a $30 PBI polar bear adoption kit and a signed copy of The Last of the Polar Bears “Pre-Dawn” book. Laura’s memorable entry combines a subdued color palette with a poetic narrative to deliver an important message that tugged at my heartstrings. Details like the polar bear’s somber facial expressions, and cold puffs of air, help heighten the emotion of this piece. Beautiful. 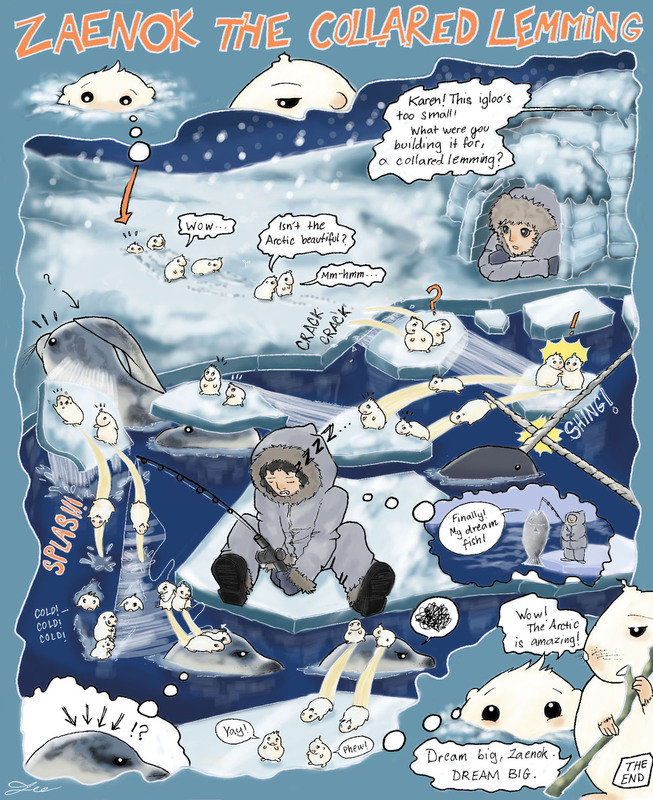 The Last of the Polar Bears - Arctic Animal Comic Competition Results!